When it comes to our eating habits, it’s clear that we’re doing it wrong. We may be in the midst of health crisis, but there are few practical solutions for dealing with it. But now a growing chorus of people are claiming that modern and processed foods are to blame, insisting that we should instead take an “evolutionary approach” to our diets and turn to foods that were eaten by our Paleolithic ancestors. Critics have responded by proclaiming it a misguided step in the wrong direction. Either way, Paleo eating has become a major lifestyle. There’s no question that something’s terribly wrong with the way we eat. Nearly one in three Americans is overweight or obese, and rates of diabetes continues to rise. These conditions, along with steady rates of heart disease, cancer, and inflammatory problems, have led some to predict that the young generation now growing up will the first ever in our history to have shorter lifespans than their parents. Part of the problem is that virtually everything we thought we knew about eating is wrong; the current health crisis is in no small part caused by widespread and pervasive food confusion – and much of driven and reinforced by the modern food industry. As counterintuitive as it might seem, we now know that saturated fats are good and that salt has been unfairly vilified. It’s becoming apparent that whole grains are extremely unhealthy, and that sugar is far, far worse than we previously thought, a conclusion that has led some experts to essentially describe it as poison. At the same time, grocery stores are filled with fat-free and fat-reduced products – and the obesity problem persists. Fad diets have virtually no staying power, much to the delight of those offering them. We have become a fat-starved people, who, in its place, have substituted high density carbohydrates like bread, white potatoes, rice, and other sugar infused foods. But like so many things in life, there often comes a time for corrections, and diet is no exception. To address the situation, a growing number of people are proclaiming that modern foods are to blame, or more specifically, those foods that came about as the result of the Agricultural Revolution and, more recently, the larger food industry. The answer to many of our health problems, they suggest, is to look at our evolutionary history and see what it has to say about what our bodies were actually meant to eat. It’s been said that nothing in biology is worth knowing outside of the context of evolutionary biology. Human nutrition is no exception. The human genome has remained relatively unchanged for the past 120,000 years – a lengthy expanse of span of time during which our Paleolithic hunter-gatherer ancestors primarily ate meat, with some vegetables, fruits, nuts, and seeds. Evolution ensured that humans were well adapted to eat those types of foods, and their bodies were happy to receive them. It’s only been in the last 10,000 years, however, that humans have started to engage in agriculture, a technological and sociological development that has resulted in increased reliance on grains, legumes, and dairy — what are now Neolithic staples. Trouble is, our bodies haven’t the foggiest idea what to do with these foods, and in some cases, they’re actually toxic. Shockingly, it’s been over these past 10,000 years that humans have become significantly shorter, fatter, less muscular, and more prone to disease. It’s this realization that has led some thinkers like Jared Diamond to proclaim that agriculture was the worst mistake our species has ever made. While it’s been great for society as a whole, from a health perspective it’s proven catastrophic for individuals. Consequently, a new approach to eating has emerged called the Paleolithic Diet, or simply “Paleo” for short. Advocates of this diet focus on eating unprocessed foods like lean meat, seafood, roots, tubers, fruits, and vegetables. Not only are these foods comprehensible to the human digestive system, they pack much more nutrition per calorie than typical Neolithic and processed foods. In terms of what not to eat, followers of the Paleo diet refrain from eating grains, legumes, and dairy — each of which contains toxic elements that our bodies have never had a chance to adapt to. These foods fatten our physiques and shorten our lives. Paleo advocates claim that by avoiding these foods, and eating more along the lines of how our ancestors ate, we can stave off such problems as obesity, diabetes, cancer, and cardiac disease. One of the leaders of the Paleo movement is biochemist Matt Lalonde. He believes that the “eating like a caveman” approach is helpful, but incomplete. It’s not enough to just eat in an apparently evolutionary-friendly way. Rather, we need to do actual science and determine optimal eating habits. It just turns out that his findings tend to support the central assumption made by Paleo advocates. 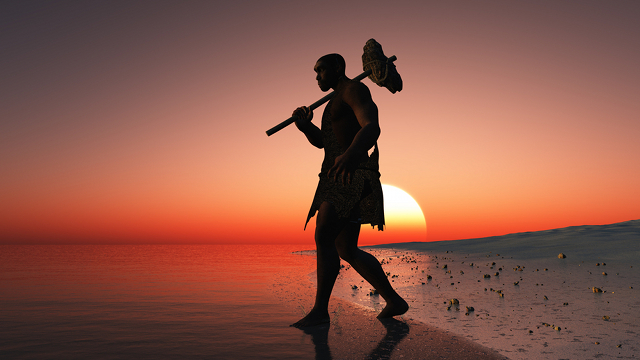 Science also brushes shoulders with Paleo at the Ancestral Health Symposiums that are held once a year. Last year’s confab featured over 50 speakers representing a diverse cross-section of disciplines. Titles of presentations included, “The Trouble with Fructose: A Darwinian Perspective”, “Heart Disease and Molecular Degeneration”, and “What Foods Make My Brain Work Best?” The symposiums have featured heavy hitters in the health sciences, including Loren Cordain, Gary Taubes, and Robb Wolf. These symposiums demonstrate how a niche group of scientists, medical practitioners, and health experts are paving the way for what is likely to become a health and wellness paradigm for the future. One of the many refrains of the Paleo movement is that Neolithic foods cause a number of health problems. Take whole grains for example. Paleo advocates believe that a primary reason for our poor health relative to our Paleolithic ancestors is the introduction of a protein called gluten, which is found in many staple grains. That’s because gluten may, in fact, be a poison. Many plants have evolved chemical defenses to dissuade animals from eating them. Think of it as a kind of chemical warfare, with gluten being a particularly nasty weapon. It turns out that people suffering from the celiac disease, which is an autoimmune disorder, aren’t the only ones sensitive to gluten. In fact, it has been shown that all humans react poorly to it. According to Robb Wolf, author of The Paleo Solution: The Original Human Diet, it’s for this reason that everyone should avoid gluten which tends to be delivered by consuming whole grains. Other foods that cause similar reactions include lectins, phytates, and protease inhibitors. Together, these compounds limit protein and mineral absorption while inflicting severe inflammatory responses. Wolf compares this effect to having poison oak lining our intestinal walls. These gut-inflaming elements cause inflammation to the digestive tract, and by consequence, to the rest of the body. And as we’re increasingly learning, inflammation is a contributor to a number of health problems, including impairments to the immune system and the body’s ability to recover. Wolf also suggests we stay away from legumes, dairy, sugar, and processed vegetable oils. These have the same gut-irritating and inflammation-promoting properties. As a result, Paleo devotees tend to refrain from cheese, milk, soy products, and peanuts, which technically speaking is a legume. They also avoid all processed foods, which tends to be laden in added chemicals and preservatives. At the same time, Paleo devotees laud the benefits of fat. Not only does it taste good and have the ability to stave off depression, it’s fairly essential. Robb Wolf is a big promoter of increasing our total fat intake, suggesting that we consume half of our calories from fat. Indeed, the hysteria against fat is starting to wane. The findings of a recent meta-analysis of 21 studies published in the American Journal of Clinical Nutrition supports the revelation that no single study could associate saturated fat with increased risk of coronary heart disease, stroke, or coronary vascular disease. And at the same time, it does the mind and body good. An indelible component of Paleo is eating meat. It’s valued highly for its protein, fats, and essential nutrients. But not all meat is the same. Folks on the Paleo diet place considerable emphasis on eating grass fed organic meats as opposed to grain fed stock raised in factory farms. It’s been shown that grain fed beef contributes to a skewed omega 3 to 6 ratio and that it impairs our ability to absorb nutrients. Factory farms also infuse their livestock with hormones and other questionable chemical concoctions. Paleo dieters are increasingly turning away from these foods, preferring instead to eat “clean” meat. It’s for this reason that dairy tends to be vilified in Paleo circles. Most milk comes from grain fed beef and cause the same inflammatory problems as the meat. Cows, it would seem, react just as badly from gluten in grains as humans do. Critics of the Paleo diet complain that the meat-centric approach is completely out of line with other trends, namely the shift to vegetarian diets. Paleo eaters are often seen by vegetarians and vegans as a selfish group that are looking to take society backwards instead of forward. Ancestral health enthusiasts, on the other hand, make the claim that they are in fact charting a course to the future by overturning conventional models of meat production. Paleo eaters tend to avoid factory farmed foods, insteading buying organic and free range meats and eggs from farmer’s markets and organic food stores. Moreover, they are also advocates of sustainable, humanitarian farming practices and the promotion of healthy, untainted foods. An animal that got to live its life on a farm grazing in pasture, they argue, is a far cry from the crammed and deplorable conditions found in most factory farms. It’s for this reason that they claim to be “conscious carnivores” and purveyors of a more sustainable future. Quality, rather than quantity, is a central tenant of the Paleo diet. It’s for this reason that people on Paleo are content to spend two to three times more on their foods than what’s found at regular supermarkets. Clearly, Paelo meat-eaters and vegetarians are going to forever disagree on the ethics of the matter. Fundamentally, vegetarians argue that it’s never right to raise, kill, and eat another animal, whereas Paleo folk contend that personal health takes precedent, and that it’s normal and natural for us to eat meat; it’s what we’re evolved for. Dietary habits are an incredibly personal thing. Fewer subjects raise more controversy and heated opinions than food politics. Ultimately, however, when it comes down to making dietary choices, it tends to be about what works best for the individual – whether it be on account of health, environmental, or ethical considerations. Essentially, people need to ask themselves about how their food choices make them feel about themselves as moral agents, and how those choices impact on their personal health and well-being.